Industrial style came to us from New York in the 90s of last century. It originated in the former warehouse, industrial and factory premises. That’s what relating it with Loft style. At that time, many buildings changed their purpose and from the functioning places turned into abandoned ones. Naturally, some adventurous people wanted to bring them into the proper form. Today we are going to review and explore industrial interior design style: description and photos will help us to dive deeper into the philosophy of this trend. Initially these were public or industrial premises, their areas were huge. Therefore, in new status these buildings acquired public purpose – hotels, motels, bars, restaurants, art galleries, shops. A little later, the industrial style reached the living quarters and is now especially often used in loft styled spaces. It is created in the industrial zone, utilizing many of the attributes that were in the building before the renovation: walls, windows, floors, beams and ceilings, stairs, elements of machinery and equipment – hoods, pipes, ventilation. This kind of style can be created in any room, up to an ordinary apartment. All attributes inherent in the industrial style are created artificially: decorative bricks are laid or special wallpaper “à la concrete” is applied, characteristic for industrial buildings accessories are selected. And now we propose to dwell on the main characteristic features of the industrial style. Since the industrial style is created on the area of industrial buildings, the necessary space for its creation in residential premises should be corresponding: starting from 100-200m² (more than 2000 square feet). High ceilings, huge windows, ceiling beams or pipes of different diameters are indispensable attributes of industrial style. 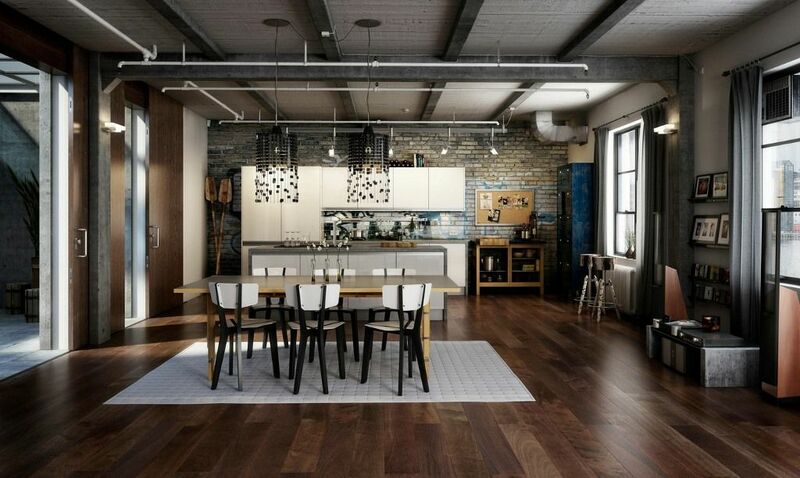 Industrial style looks especially successful in rooms of loft, which fully meets the concept of this style. When carrying out renovation in the old room, the main thing is not to overdo the eradication of the house’s initial elements. It is important to leave carelessness and manufacturability outside, that is, do not hide the flaws in repairing too deeply under the new paint, but to retain the communications and frayed walls. Aged wood, metal with traces of rust or patina, and concrete are the main components of this style. The feature of metal in industrial style is the lack of metallic luster, it should be matte. If you get a building with a large number of ventilation pipes and shafts, do not dismantle them in no case. Beams, pipes, metal frames of furniture – all this will be very appropriate looking and in a renovated room too. As well as the old doors and windows, the remains of equipment will fit. The palette corresponds to the factory premises – gray, white, red, beige, black, khaki, dirty blue. Consider any of these colors as a background for the interior and then add color accents in a small amount. Do not get too involved in bright accents, after all, this is a place with a “harsh” industrial past and it is important to remember this. Very good idea will be using one color throughout the interior, but only arrange it in different shades and use for everything – the walls are lighter, the floor is slightly darker, the furniture is even brighter, and combine different shades with each other in the decor. This idea is well suited for gray, beige, brownish palette. And the whole space will play like a watercolor painting. In addition, the borders will be supported by different textures: smooth and rough concrete, metal of different degrees of gloss, untreated and smooth wood. Huge windows are an integral part of the industrial style. Through them, a lot of light breaks through, which is literally floods the whole room on sunny days. Skylights from a roof or the big roof windows will be well inscribed in industrial premise. Window frames are better to be wooden, aged or aluminum, also aged. Curtains on the windows, as a rule, are absent, or the choice falls on simple, light, and natural materials of light colors. Graffiti on the walls, the remains of billboards and advertising boards, posters, signs and remains from installations and art objects will perfectly fit into the industrial style. It is important to remember that the decor should be humble – just a few pictures, a couple of sculptures and photographs on a monochrome background, because the concept of industrial style is closely related to minimalism. You can decorate the brickwork with different shades of brown, draw something directly on the wall, add applications, and make a frame for a mirror or a picture. The industrial style is foremost valuable with giving a huge scope for creativity at low cost.